I usually do not like furry science fiction. My problem is that furries tend to start with furry, and add the science fiction later. The visual of a walking, talking fox/cat/rabbit/whatever is introduced in the mind of the furry author, and an explanation is cobbled together as an afterthought. To call this a disservice to science fiction is an understatement. 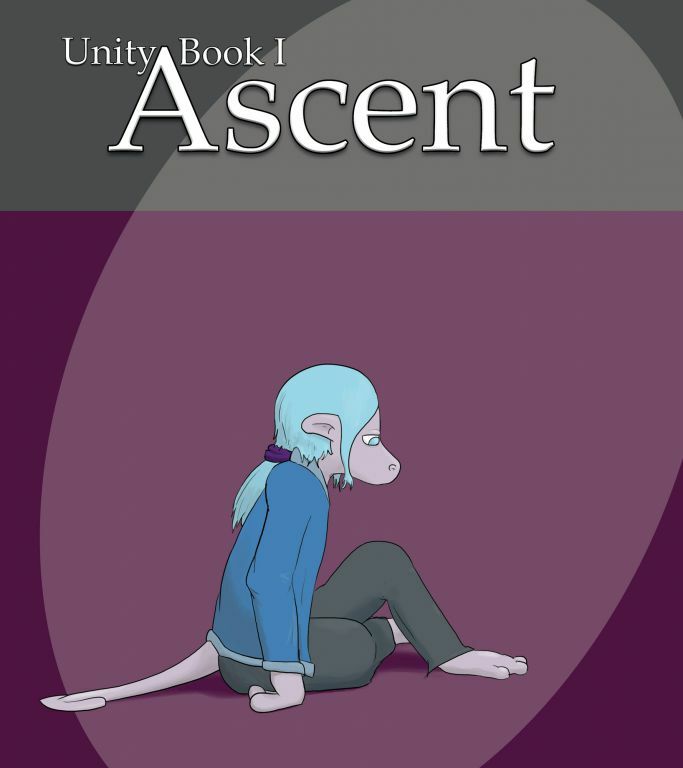 The comic strip Unity written by fluffy (the author is dedicated to the pseudonym, even putting it on the spine of this collection of the first major storyline), is a rare example where the science fiction does not suffer as a consequence of the furry aspects of the piece. The story begins with a scene that would be a bit cliché if this were a video game; the main character wakes up with amnesia, not remembering such important characteristics as what it is, where it is, or even its name or gender. I felt like I should be entering this information in myself. However, the character soon learns that it is named Juni Melrose, that it is a member of the Kayoshan species, and that it is, in point of fact, an it; that is, genderless, though by choice (and surgery), rather than nature. Juni spends the story trying to discover why it allowed itself to lose its memory, while also discovering the very nature of its world, which is very different than what most of the inhabitants believe. However, it turns out all the strange alien creatures are based on Earth animals, just not the type normally found in furry comics. Juni is a descendant of a platypus, while the bizarre slug-like creatures are anthropomorphic sea slugs. The neat science fiction trick is that Juni’s appearance is not based on platypuses; the trait for which platypuses were modified into sentient beings has nothing to do with how they look. In the course of changing the platypus into a form more useful to the task they were made to perform, their appearance changed. It is absolutely wonderful hard science fiction, and Juni’s quest for answers, and the clever answers when they are revealed, provides the real reward for reading this collection. Unfortunately, there are a few problems. Though adept at science fiction writing, fluffy is not the greatest artist in the furry fandom, to put it mildly. The art is simple, and not very technically polished. However, at least it is consistent, and fluffy seems painfully aware of the artistic shortcomings in the book’s introduction, so that’s all I’ll say about that. The original strip form is also not the best way to tell this story. The book collection helps smooth this out. As it is, there is a bizarre stop-and-go feeling to the story due to the strip format. This is not a humor-based strip, which can overcome this feeling with jokes. However, in this case, when a strip does end in a joke – even when funny – it seems forced and draws attention to the form in a bad way. This series originally featured pop-up text; usually a short, sarcastic comment from the author. These have been wisely moved to their own section in the collection. They are often very funny (strips 117 and 118 were particular favorites), but would have been distracting to the story, which is the real star here. I recommend this strip for its clever use of anthropomorphic animals in a hard science fiction setting, despite problems with the art and pacing. The strip works better as a book than in the original setting, though for a lot of furries this will be offset by the fact that the webcomic is still free. The collection costs $16.99 in paperback (full color), or $4.99 in Kindle format from Amazon.com. A review copy was provided by the author. I agree with everything you say, especially the criticisms. I think a lot of the pacing issues were less to do with the strip format and more because for the first half of the story I had no idea what I was doing or where the story was going (it actually all grew from the simplistic idea of having a character for which every bit of identity was stripped away - the entire story emerged from that terrible video game cliche beginning! ), and at many points I actually took several months off right in the middle of a chapter because I'd spontaneously lost interest in things before another spark got me moving along. I'm hoping to get a few more stories done in order to put together a second book, as I feel that my artwork and storytelling both improved quite a lot over the course of this comic, and have only gotten better since (not that it's anything fantastic or anything, but for me the art is a tool with which to tell stories that would be difficult to put into words). 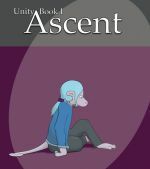 Interested readers should look at the other Unity arcs which are all listed at the top of the Unity archives (I recommend starting with Planetfall). I wish the price could be a bit lower, but unfortunately, full-color printing costs a lot, and between that and the distribution costs the underlying per-unit prices add up. The book exists more as a way of keeping some sort of longer-term physical permanence on a fleeting digital good than anything else, though. I think Fluffy should write and somebody else draw. Two heads are better than one. I'm too much of a control freak for that. At one point I did try getting other people to take over art duties when I was having wrist problems but the only artists I could get to step to the plate tended to take a long time and misunderstood the design of the universe (because I wasn't explicit enough about that design). Don't give up; try again and try harder. I prefer to just try harder by improving my own art. Also most good comic artists aren't going to do on-spec comic pages for free unless they really believe in the project and want to make it a labor of love, and that's not a situation I want to rely on. Well, I find it hard to read anything if the artwork is anything less than decent. Is there a version of Unity without pictures? You could make one. You could just read the OhNoRobot transcripts or the textual recap if you really want a text-based experience. The Kindle version actually embeds the ONR transcripts in the image alt text so there might be a way of extracting a script from that. Or, since the comic itself is released as Creative Commons, someone else could redraw the whole thing if they wanted to. I'm not really sure how having to describe things with a thousand words is any better than drawing a picture, however crude. We have different opinions and tastes. I thought that was obvious. Sure, and I'm not interested in arguing about those tastes. I'm just saying there are other options for you to get the story without having to put up with the crappy art. Or you can start with the followup stories (Planetfall, Breeder, and Meat) and then decide whether the art is bad enough to prevent you from reading Ascent as well. Even if I were to team up with a more skillful artist, that won't change the art that's in the existing stories, and the existing stories are pretty important. If you like I can produce a text file that is made of the entire story's transcripts. Since the transcripts are reader-submitted they tend to have varying and inconsistent levels of detail, but at the very least all of the dialog is there. If you do that, I'll read it. Well then, here you go. You really are better off with the pictures, though, even if they're not particularly well-drawn.